Opinions of President Obama's speech appear to fall along party lines. Sen. Tom Harkin: "I also applaud the president's investment in education"
Sen. Sheldon Whitehouse: "President Obama laid out a firm and positive agenda"
The Tea Party Express: "Tonight was a night of hot air"
(CNN) -- Reaction from all sides flowed in directly after the president's State of the Union address. "Tonight the president spoke directly to the people in his first State of the Union address about the problems we face as one nation and what we can do to help families weather the tough economy. "I hear from West Virginians every day who are hurting, who are hoping we can deliver good-paying jobs and health care reform to our state, and whose lives are affected by the downward trend in our economy. Congress has a job to do to deliver real solutions to help people, I know that, and so does the president. The president recognizes this will not be an easy task, and he has laid out an ambitious plan to bring about a positive jump-start to the economic challenges we face. "The president understands that jobs must be our focus and he has provided a framework that I believe can put this nation on a path to recovery. "Supporting our brave men and women fighting to keep us secure. "As chairman of the Senate Commerce Committee, my ongoing No. 1 priority is getting our economy back on track and making sure the needs of West Virginians are being met. I know it's been a long road ahead and we have much work still to do, but I also know that our country can come together and shift the momentum back in our favor and bring the optimism we deeply cherish back to our communities -- we have done so before, and we will do so again." "I was pleased to hear President Obama acknowledge that our economy must be a national priority and I applaud him for taking some important first steps. But putting America back to work requires bold action. Bold action means broad-based tax cuts for families and businesses to create jobs and not merely targeted tax relief. Bold action also means major reform and restructuring to actually cut spending and not just freeze it. I look forward to working with my colleagues on both sides of the political aisle on far-reaching new initiatives that will put our economy back on track and get our fiscal house in order." 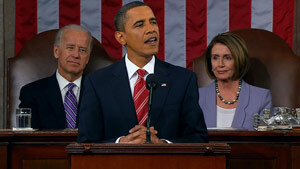 "In his State of the Union address, President Obama asked Congress to repeal the 'don't ask, don't tell' policy. I am immensely proud of, and thankful for, every American who wears the uniform of our country, especially at a time of war, and I believe it would be a mistake to repeal the policy. "This successful policy has been in effect for over 15 years, and it is well understood and predominantly supported by our military at all levels. We have the best trained, best equipped, and most professional force in the history of our country, and the men and women in uniform are performing heroically in two wars. At a time when our Armed Forces are fighting and sacrificing on the battlefield, now is not the time to abandon the policy." "Tonight the president spoke to the American people in real terms about the state of our economy and the challenges of the year ahead. He outlined a road map that, if followed with bipartisan support in Congress, can reduce our deficit, rebuild our economy and create a new foundation of prosperity for American families and businesses. "The president reaffirmed tonight that it is essential to enact strong and comprehensive health reform. Half measures won't protect the American people from skyrocketing costs and insurance company abuses. I look forward to working with the president and with my Senate and House colleagues to finish the job we started more than a year ago. "I also applaud the president's investment in education. I am particularly pleased with the increased funding for K-12 education and look forward to working with the president to help educators improve our public schools. So, too, am I encouraged that the president has proposed incentives to make child care more affordable, which is critical to helping families work while ensuring children start school ready to learn. "As we continue to work on measures to create jobs and economic opportunity in the short term, it is important that we also build families' future security as well. The recommendations the president offered tonight recognize the everyday pressures that families are facing, and are important first steps to help them succeed and build long-term security. "And as we work to transform America into a genuine 'wellness society,' it is encouraging to have the support of this administration, which recognizes that America is in danger of raising the first generation of children who will live sicker and die younger than the generation before them. I am thrilled to see the first lady taking steps to address the childhood obesity epidemic. "In the year ahead, we will also renew our commitment to child nutrition programs, an effort that began while I was chairman of the Senate Agriculture Committee. Today, as a senior member of the committee, I look forward to seeing that process through by expanding access to these programs for vulnerable Americans and ensuring healthier food options are available. "Washington can and should work for the people and with the agenda ahead, we can get the country back on track." "The president came before the nation this evening with an opportunity to acknowledge the message Americans are trying to get past the stone walls of our nation's capitol. Unfortunately, it appears he's completely stone deaf. After yet again blaming all our problems on George W. Bush, the president doubled down on his commitment to a Washington-knows-best strategy that will only make matters worse for struggling workers, families and small businesses. "The American people have made it clear they are angry with how Washington does business. They want their elected officials to listen to them. Tonight, the president ignored their concerns by giving a full-throated defense to the very policies the American people oppose -- a massive $2.5 trillion health care monstrosity, a job-killing cap and trade bill, and more spending on programs that won't create jobs. "The president's $2.5 trillion health care bill that raises taxes, increases the debt, and slashes Medicare by a half trillion dollars exemplifies everything the American people have come to hate about Washington. If the president is serious about real reform, he should scrap the current proposal, start over from scratch, and work with all of us in an open and transparent manner on a bill that confronts the No. 1 concern across the country: reducing health care costs. "Unfortunately, the president's theme of 'rescue, rebuild, restore,' is just more of the same from this administration of more government intervention into every aspect of American life -- our education, finances, energy and health care. I don't want our nation's CEO 'rescuing, rebuilding, and restoring' our country the way he's 'rebuilt' General Motors. "Real bipartisanship requires more than just lip service -- it demands both sides coming together in a real and meaningful way. It's time for the administration to abandon this big-government agenda and start working in a meaningful way with Republicans to find common-sense solutions to move the country forward." "With the American people disgusted by our growing debt, out of control spending, and nonexistent job creation, the president's main priority needs to be turning our economy around. While the president's call for a spending freeze is an important first step, the devil is in the details. This proposal falls woefully short of what Americans demand -- a smaller, less expensive federal government. We need to move further and make actual cuts if we are truly serious about reversing Washington's spending habits. "When it comes to health care reform, I applaud the president's willingness to listen to competing solutions, but only his actions and leadership will allow those solutions to be part of the debate." "The president is always welcome at the Capitol, especially at a time when there is so much important work to be done on behalf of the American people. "The president talked about jobs tonight. This is a welcome change in focus after the president and his administration spent nearly an entire year pursuing a partisan health care plan that would have spent trillions of dollars we don't have rather than on a plan for getting Americans back to work. I'm hopeful the administration's new focus on the economy will lead it to say no to more spending and debt, more bailouts, and more government. "The president's words about the importance of deficit reduction are timely. The times require that we build upon these modest proposals. Americans are concerned about what kind of country we will leave to our children. The administration could address this concern right away by directing unspent stimulus and TARP funds to pay down the federal deficit, and it could implement a true spending freeze. It could also assure families and small businesses that their taxes will not go up at the end of the year, as currently planned. "The administration could also reassure Americans who are still rattled by the attempted Christmas Day bombing by vowing to make a priority of preventing the next terrorist attack, not treating captured terrorists like common criminals so we can place them in a civilian court. Americans have a right to find out everything captured terrorists know in order to prevent future terrorist attacks. "Americans are concerned about government spending, debt, jobs, and keeping the homeland safe. They expect us to focus on these core issues until we get them right. In the year ahead, there is much work to be done, and the task before us is clear. We need to get Americans back to work and remain focused on keeping America secure and putting our nation back on the road to prosperity. Republicans look forward to working with the president on these shared goals." "We should not be concentrating on what divides us. Rather, we should focus on what we can agree on so we can move America forward to deal with the problems confronting our country. I think that is so very very important. "Tonight he did mention something that is very near and dear to my heart. He said that he was going to create a presidential budget commission by Executive Order to deal with our growing national debt. I would have loved to have seen him go to the leadership in the House and Senate and ask them to continue work on a statutory bipartisan budget commission to deal with this problem. If we don't solve it, it will bring down our economy, hurt our national security, hurt our national peace and -- most of all -- cripple the future of our children and grandchildren. "I also would have liked to have heard more in terms of jobs. The most important thing we can do to right now to create jobs is to reauthorize the highway transportation bill. Thousands of jobs are out there -- an industry is on its back with 30 percent unemployment. By passing a robust new highway bill we would be telling our economy 'you're going to be OK."
"Overall I think the president did a good job, but I would have liked to have seen a little bit more passion, and more pressing of the message to Congress that he wants to work together -- what we have been doing doesn't work. We need to work together to move America ahead, put aside the partisan politics, join hands and make a difference for our country. "Tonight, President Obama laid out a firm and positive agenda to address our nation's many serious challenges in the year ahead: a struggling economy, two wars, rising health insurance costs, and so much more. "I've heard from so many Rhode Islanders who are still struggling to make ends meet. Tonight, I hope families in our Ocean State will take some comfort in knowing that our president's top priority for 2010 will be putting the American people back to work. "We started the process last year of fixing the mess President Obama inherited with the American Recovery and Reinvestment Act, which helped stabilize state and local budgets and prevented layoffs of teachers, police officers, and other municipal employees. It has also been particularly helpful to local business owners such as Enrico DiGregorio, my guest for tonight's speech. Enrico owns a contracting business in Smithfield, and has been able to hire 35 people for jobs funded by the Recovery Act. We need to make sure Rhode Island has more success stories like Enrico's in 2010, and I'm confident that the plan President Obama outlined tonight will move us in the right direction. "I was also encouraged to hear the president reaffirm his commitment to passing meaningful health care reform, addressing global warming, investing in clean energy, and helping to make college more affordable for middle class families. These goals are essential to our country's long term economic stability, and I hope our nation can address all of these issues in the coming months and years. "President Obama tonight gave us hope for better days ahead and a blueprint for renewed American prosperity. I will continue to work with my colleagues in the Senate to provide quick relief to struggling Rhode Islanders." "Americans aren't looking for another good speech; they are looking for a good job. Unfortunately, tonight we got another speech instead of a concrete plan that will create jobs. When you add the tax increases that are expected to be in the president's budget on Monday to pay for the poll-tested proposals we heard tonight, it is tough to see how small businesses will actually get back on their feet and be in a position to start hiring again anytime soon. "I'm equally concerned that the president is not listening to the concerns the American people have about his health care bill and the way he went about writing it with Democrats in Congress. There were far too many backroom deals that favored special interest group after special interest group, producing a bill that would cause most Americans to see their health care premiums go up and seniors' Medicare benefits slashed. I hope the president will step back, start over, and work with Republicans and Democrats in Congress to find a bipartisan path forward to actually lower health care costs and the price of coverage. "As for trade, actions speak louder than words. Over the past year, this administration and Democrats in Congress have done little to promote U.S. exports even though we all agree that exporting more American made goods and services will create jobs here at home. The president's inaction has put American companies and workers at a crippling disadvantage internationally as other countries race ahead to take these markets from us. I welcome the president's new sentiment and hope he follows through -- I am committed to helping open new markets to create good-paying U.S. jobs." "Tonight was a night of hot air, delivered in a way too long speech that revisited pledges we've quite frankly heard from Barack Obama before. "His comments in the State of the Union were similar in tone and substance to his comments made after he won the 2008 presidential election and during his inauguration. "But actions speak louder than words, and this administration violated its promise for increased transparency. Lobbyists were appointed by the president to positions he swore would never be filled by former lobbyists. "Worst of all, we've seen out-of-control spending, and an unparalleled growth in the size and power of government. "We'll start to believe Barack Obama when his actions match his words. Until then, it's just more empty promises, and we've all heard far too many unfulfilled promises from the politicians in Washington. "In our opinion, the best part of this speech was the end." • House Speaker Nancy Pelosi (D-California), leaving the chamber said, "It lived up to his standards." • Rep. Steny Hoyer (D-Maryland) said, "It was a serious speech -- reached out to Republicans." • Rep. Van Hollen (D-Maryland) called it "a booster shot -- an important moment."